Go forward in time to August 2009. Igalia will be sponsoring the GNOME Party tonight. If we are lucky enough, we will have a few music instruments for a jam session. Check Juanjo's blog for more details. 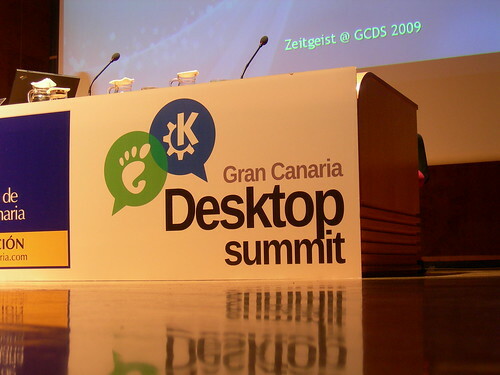 If you have GCDS pictures, add them to the Gran Canaria Desktop Summit flickr group. As all the other cool kids in town, I'm flying to Las Palmas de Gran Canaria, to attend the Gran Canaria Desktop Summit. In practical terms, this means GUADEC, GUADEC Hispana, Akademy, and, eventually, other conferences/activities that might be arranged during the big event. Partly because of laziness, partly because of having really busy weeks lately (both work and life-wise), I won't be presenting anything during GUADEC Hispana, although I would have liked to. 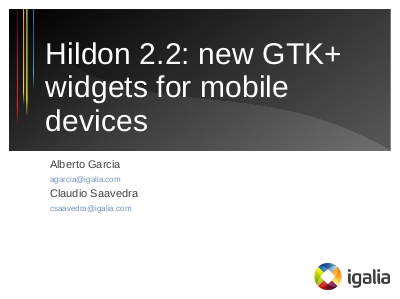 However, Berto and I will be giving a talk on the new Hildon toolkit for Maemo 5, during the Mobile Day. Besides introducing the new widgets and UI style for Fremantle, we will also talk about the difficulties we have been facing during this major revamp of the toolkit, which will hopefully serve to clarify some of the doubts spread around lately. Joaquim, one of our new superheroes at Igalia, has been porting the Eye of GNOME to Maemo 5 using the Fremantle Beta SDK and the widgets in the new Hildon toolkit. Joaquim's work is a live example of the look 'n feel of Fremantle-style applications. I'd recommend to anyone writing or porting applications for Fremantle to have a look at his screencast and, of course, the application. Go backwards in time to June 2009.